Do you want an easy way to stay connected with your network on LinkedIn? Or maybe you want employers to discover you. 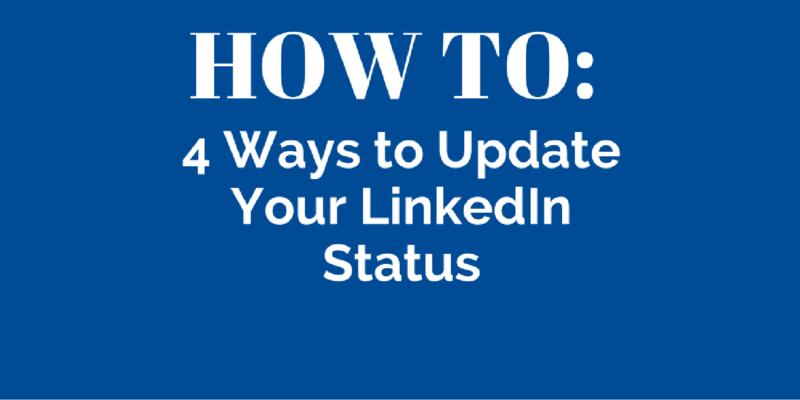 Updating your LinkedIn profile regularly is one of the best ways to do both! 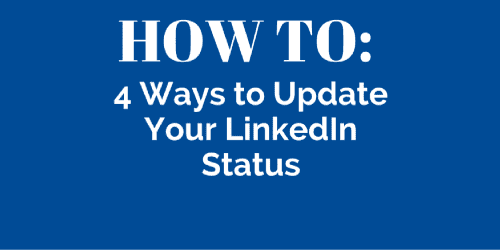 People have asked me HOW to update their LinkedIn status, so here are four easy ways you can update your LinkedIn status and share information. If you read my earlier post on 10 types of status updates for job seekers, you know what kinds of things you should be including in your status update. Daily updates may sound like a lot of work, but, it is unlikely that your connections on LinkedIn will see everything you share. LinkedIn frequently makes changes to what you see in your newsfeed. But what I know for sure is that if you do update your status daily, you will absolutely see more people viewing your profile. Your status updates can tell people what you’re doing (event’s you’re attending), you can share a profound thought or quote, or you can share the something written or shared by someone else. When you log into LinkedIn, you end up on the homepage. This is the section at the very top where you would add your status update. Quick Tip: By default, LinkedIn shows you the Top (most popular) content in your home feed. If you want to see the most recent updates in your home feed, you can change this. It is located just below your status update area. Your change will not stick, so whenever you log back into LinkedIn, you have to change this to see most recent. Every website provides sharing buttons (almost) so you can share the article on different social media sites. Just click on the icon to share it to the social media platform and you’ll be on your way. If you don’t see the icon you are looking for, let’s say LinkedIn, just copy the article’s URL and past it into your LinkedIn status box. A best practice is to add your thoughts/comments/questions to the introduction of the post so your network gets a better sense of why you are sharing the article. This is what the next screen will look like once you’ve clicked the icon. Sharing an article as a group discussion is a bit more work. You’ll have to copy the link and paste it into your update on the group’s page. This a new change and perhaps it is LinkedIn’s way of reducing junk being posted in groups. Remember, the best way to use LinkedIn is to create conversations (not just sharing links). If you find lots of great articles and you don’t want to share them all at once, you can space out your status updates by using a scheduling tool like Buffer. Buffer is a free app that lets you auto schedule or set the date and time you want a post to appear. Here’s the time saver tip: if you find five great articles in one day, you can space them out and share just one per day by using Buffer. Your work is done for the week! 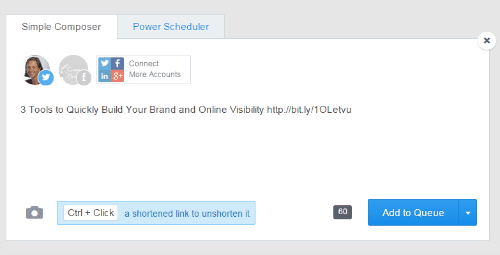 Buffer allows you to share status updates on Facebook, LinkedIn, Twitter, Google+ and Pinterest. But as a free user, you are limited to you can connect to one account per each social network (up to a max of 3 accounts total)- For example, you can link to your LinkedIn profile, your Twitter profile and your Facebook profile. And you can only have 10 scheduled updates in your queue. You should also take a look at this from LinkedIn: Your Recent Activity On LinkedIn. When you share a post on your LinkedIn feed, you can choose whether to share your post publicly or to your connections only. If you share a post publicly, or if you like or comment on a public post, this will be visible on your Activity to all LinkedIn members. 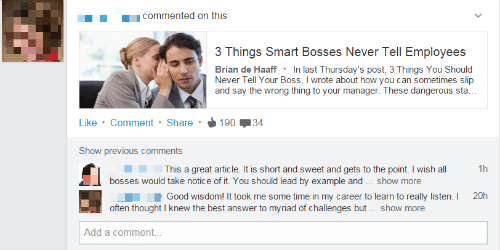 Whenever you like something on LinkedIn, it will show up in your network’s newsfeed. Likewise, when you comment on a status update or group discussion, it will also show up in your network’s news feed. Sharing an article or posting a discussion on a group also updates your network. Updating your status by sharing on-brand articles is one way to stay in front of your LinkedIn connections. Just remember, out of sight, out of mind! Keep visible. Keep connected.